Has Unemployment Not Fallen under Gov. Jim Justice? Unemployment has fallen across the country in recent years. But the West Virginia Democratic Party said in a recent tweet that it hasn’t fallen on Republican Gov. Jim Justice’s watch. In a Jan. 9 tweet, the state party wrote, "FACT: Unemployment rate has not decreased since @WVGovernor took office. #wvpol #WVSOTS19"
Justice, elected as a Democrat in 2016, took office on Jan. 16, 2017. That month, the unemployment rate in West Virginia was 5.3 percent. Justice became a Republican on Aug. 3, 2017. That month, the state unemployment rate stood at 5.2 percent. And today? In the most recent month available, December 2018, the unemployment rate in West Virginia was 5.1 percent. Is that a dramatic drop? No. But unlike what the tweet says, it is a decline. It’s worth noting a limitation in the data, said Brian Lego, a research assistant professor at West Virginia University. 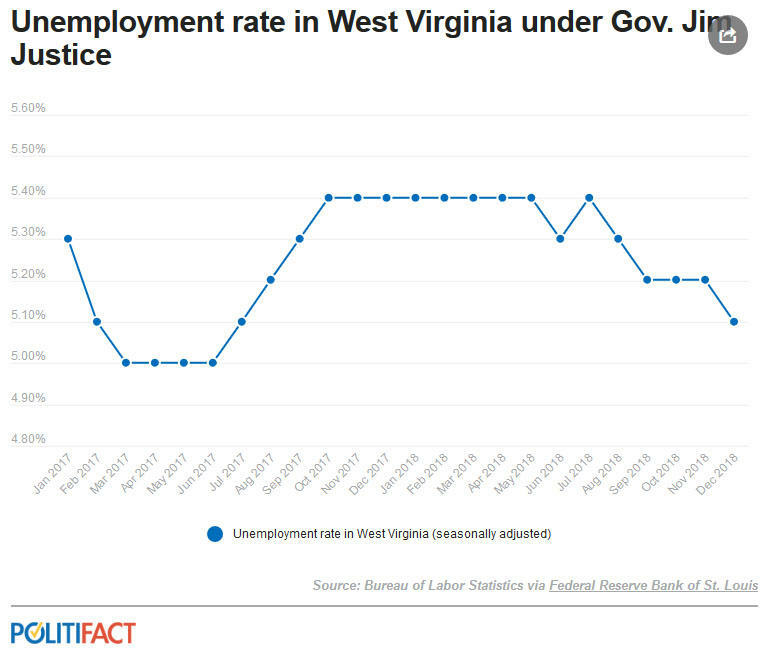 Because West Virginia’s population is small, he said, the margin of error for the survey used to track the unemployment rate is big enough to produce uncertainty about small changes in the data, like those seen during Justice’s tenure. "The change is statistically insignificant," Lego said. He added that regular revisions by the Bureau of Labor Statistics, which collects the data, could produce small changes that affect the comparison. The West Virginia Democratic Party tweeted, "FACT: Unemployment rate has not decreased since @WVGovernor took office." The state unemployment rate did, in fact, decline from 5.3 percent to 5.1 percent on Justice’s watch. That said, it was an exceedingly narrow decline -- in fact, economists say that the margin of error for the survey in question leaves in doubt how big the decline was. As Gov. Jim Justice prepares to deliver his State of the State address on Wednesday, PolitiFact West Virginia thought it would be worthwhile to take a look at the state of the state as seen through our recent fact-checks. President Donald Trump's continued cries of "fake news" come at a time when his approval rating hovers just below 40 percent nationwide. Still yet, his supporters remain vigilant and carry with them a strong distrust in the news media. But, it's not just Trump supporters losing faith in the news media -- Gallup polling shows trust in the media is down across party lines and other demographics. With that in mind, PolitiFact -- known best for its fact-checking ratings system The Truth-o-Meter -- is looking to dive right in to the places that supported Trump the most and foster a conversation.